The cabinet was made in Florence. It is veneered in ebony and incorporates 19 pietra dura, or hardstone, plaques supplied by Domenico Benotti. The gilt-bronze mounts and plaques were added in England, in the workshop of Francesco Fanelli, though it is not known for certain when this took place. The gilt-bronze strawberry-leaf crest was probably made and added in about 1830-1840. The subjects include 'Orpheus Playing to the Beasts' and the figures of Juno, Hercules and Jupiter. The cabinet was owned by John Evelyn, who travelled extensively through France and Italy during the English Civil War of 1643-1645. When in Florence, he ordered the pietra dura plaques directly from Domenico Benotti, who was then considered to be one of the 'Celebrated masters'. On arriving in England, the cabinet was most likely housed in Dover Street, London. Soon after Evelyn's death in 1706 it was moved to his country residence, Wotton House in Wotton, Surrey. In 1813, John Evelyn's diaries were discovered in a 'ebony cabinet', quite possibly this one, in Wotton House. The John Evelyn Cabinet has an ebony veneered pine carcass with oak drawers, the fronts of which are decorated with pietre dure plaques. When he was in Florence in October 1644 John Evelyn noted in his diary the virtuosity of Domenico Benotti, a pietre dure specialist. He also recorded purchasing ‘nineteen pieces of the same work for a cabinet". This implies that he intended ordering a cabinet, most likely in Florence, while he wintered in Rome. 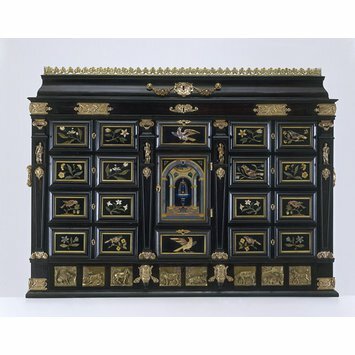 Although it has been suggested that the cabinet was made in Paris - and indeed Evelyn certainly acquired an engraved ebony cabinet from the French capital in 1652- Florence was also a centre of cabinetmaking, particularly of (often) highly elaborate examples veneered in ebony and embellised in pietre dure. These would have been made in the Opificcio delle pietre dure, the grand-ducal factory. The mounts and key escutcheons are thought to date from the mid 1640s; the brass plaques have been attributed to the workshop of Francesco Fanelli, the Florentine Sculptor who worked in England from 1631 until about 1642. It has been suggested that John Evelyn may have acquired the brass panels from Fanelli in Paris between 1646 and 1652 and had the cabinet enlarged there so as to accomodate them. It has also been suggested that the Fanelli plaques were made from old moulds of his by a former assistant by the name of John Bank, who, according to Horace Walpole, was still alive in 1713. The statuettes are somewhat enigmatic: they are styllistically closer to Northern European than Florentine sculpture at the time, and may possibly have been added by John Evelyn at a later date. Although John Evelyn moved from Sayes Court, Deptford, to Wotton in Surrey in 1700, the pietre dure cabinet is not included in his inventory of 1702, but was probably among his ‘Beds, Beding, Hangings, Cabinets, Tables ...' in his London House in Dover Street, which he left his wife by a codicil to his will of 1703. In April 1813 William Upcott, sub-librarian of the London Institution, discovered John Evelyn's diary in "the ebony cabinet in the Billiard Room" (i.e. either this one or a French Ebony cabinet, now in the Geffrye Museum Collections) at Wooton, and after some difficulty managed to persuade one of his descendants to have it reprinted. Following the interest generated by this publication, parts were added to the cabinet, no doubt to make it more romantic and antique. This included the gilt brass mounts, decorated with amorini and swags, the strawberry leaf cresting and the cabinet stand. Historical significance: The John Evelyn cabinet is important from a historical and aesthetic point of view. Not only could it have housed John Evelyn's diaries, perhaps the greatest record of morals, manners and tastes of the leading personalities in the reign of Charles II; but it is also a very interesting and rarely documented example of the English making purchases of continental furntiure during the Civil War. Indeed the years spent in continental exile by Royalists did much to bring about a radical change in English architecture and decorative arts. What they saw in countries like France, Holland and Italy often made them hanker after continental fashions and styles. Pietre Dure were renowned throughout continental Europe, and were made not only in Florence but also Rome, Paris and Prague. Nicholas Stone the Younger tried but failed to gain access to the granducal factory when he visited Florence in 1638. If one excludes various items (probably) of pietre dure formerly in the collections of King Charles I, Evelyn's purchase of Benotti's plaques is perhaps the earliest recorded by an Englishman. 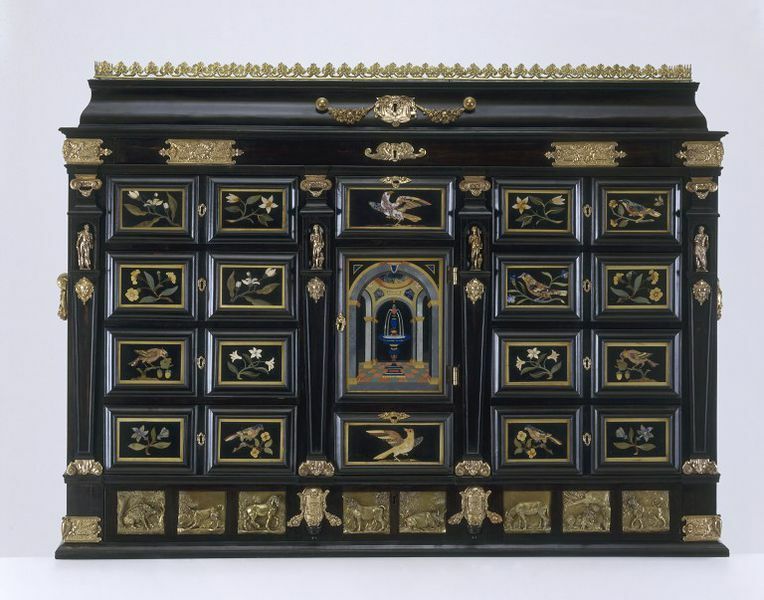 Cabinets were highly prestigeous pieces of furniture: they served to store correspondence and curios that a gentleman might collect for his own enjoyment and education. From the late 16th century, they became widespread throughout Europe. However, few cabinets, with good English provenances that date before the Restoration of the monarchy in 1660 have survived. The 19th century additions are an interesting example of romantic historicism, with strawberry -leaf cresting and plaques of amorini with swags, trying to evoke the period covered by Evelyn's diary. Beer, E. S. de. The Diary of John Evelyn. Oxford: Clarendon Press, 1955. 6 Vols. Vol. I, pp. 53 - 54, Vol. II. pp. 191. Hiscock, W. G. John Evelyn's Florentine Cabinet at Christ Church, Oxford. Connoisseur. August 1962. Vol. CL. pp. 221 - 223. Boynton, Lindsay. Some documented pieces of English furniture: 1. Furniture owned by John Evelyn. Antiques. April 1971, Vol. XCIX, No.4. pp. 562 - 566. Radcliffe, Anthony and Peter Thornton. John Evelyn's Cabinet. Connoisseur. April 1978. Vol. CXCVI. pp. 254 - 261. Oak, veneered with ebony, Inlaid marble panels, gilt bronze and brass mounts. Italian (Florence) and French (Paris); 1644 - 52. Purchased from the Simpson Bequest. The diarist, John Evelyn (1620-1706), travelled extensively in France and Italy between 1643 and 1652. In Florence he bought hard-stone floral panels made in Italy by Domenico Benotti and had them incorporated into this cabinet, possibly adding later the bronze plaques made by Francesco Fanelli.